(1) there are multiple versions of the same painting with miniscule differences between them; (2) one subject Woodward names them all similarly but in an uncommon way and; (3) the other Woodward names them very differently. Then, complicated by (4) more than one of the paintings having the same name are completely different subjects; (5) Woodward, the gallery and/or newspaper all make errors in their records; and finally (6), they exhibit at the same exhibition in 1928 (along with 4 other "Winter" paintings), and cross paths again 5 years later. All of these issues collided with regard to two subjects Woodward painted between 1927 and 1933. 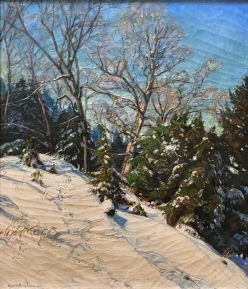 One of the subjects (Winter: from the studio series) is a snow covered field with a cluster of trees featuring a tall cherry tree and evergreen, on a slight slope with hills in the distance. The other subject (Winter Slope/ Afternoon) is a snow covered hill-slope featuring evergreens, at least one tall cherry and a sled trail. Both subjects cover at least 7 to 9 paintings, about 10 known exhibitions over 5 years. 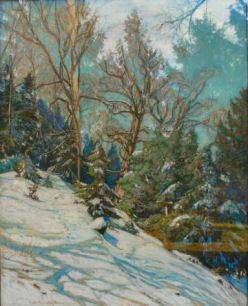 The Winter: Scene From the Studio Window series (left) is a great example of Woodward staying with a similar name but varying the name just enough to know there are "x" number of paintings. Technically, they were all named "Winter" but in only one of two known instances, Woodward used a subtitle to distinguish one piece from another. Now here is where things get funky and difficult to explain.... 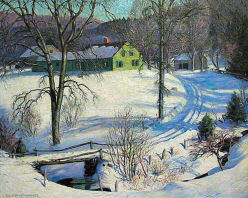 In early 1928, an oil painting named Winter Afternoon exhibits twice. We have no picture or record of what this painting looks like or what its subject matter could be. However, we do have the chalk drawing by the same name Winter Afternoon, Chalk. 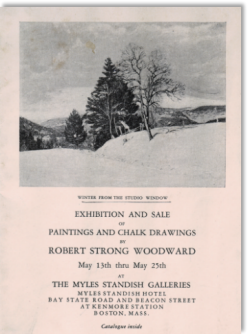 We do know from RSW's painting diary that Winter Slope, (clipping, top left) was painted from the drawing but Woodward makes NO mention of the earlier oil named, Winter Afternoon, and here is where it becomes a guessing game! Are they the same? Or are they different because, (and to complicate matters even MORE), RSW painted another oil titled Winter Afternoon, Oil, in 1940 of the old Nilman house his grandparents once lived and where he would stay in the summers as a kid. So, if you are losing track... there are now 2 names, 3 possible versions and only two of which we know the subject. Now let me add another issue to the mix. 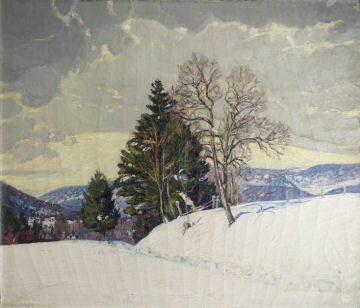 After the first Winter Slope was sold, Woodward painted a similar but larger and more square version (36 x 42) of "Winter Slope/Afternoon" and named it simply Winter. This is a problem because, Woodward did not document this painting in his diary and what's more, he previously used the name and did record Winter: Scene from the studio window without its subtitle as simply, "Winter." In the early 1940s, Woodward began to compile a record of his oil paintings we refer to as the "painting diaries." He did much of this work from his own recollections and memories. It is not clear whether or not he used old newspaper clippings and/or exhibition programs he had kept over the years. What is most striking about the diary it is both paradoxically comprehensive and incomplete. For numerous items he provided excellent information and detail. For other items there is no mention or reference at all. Woodward never included the many chalk drawings he made unless they were used as reference to an oil painting. And when it came to doing multiple versions of one scene he often only made reference to the original in his diary. With regard to these two winter scenes, involving as many as 9 unique pieces, there are only 3 unique diary entries. This seemingly lacking amount of information needs to be augmented through other sources for greater clarity. Furthermore, Woodward rarely used a "subtitle" in naming his paintings. We know of only two, Winter: Scene From the Studio Window and The Window: A Still Life and Winter Scene, both are recorded in his painting diaries without the subtitle. If you have ever had to have an item mass printed for an event then you would know that mistakes are often made. There are last-minute changes or even editorial decisions made for the sake of balance and symmetry in the layout. 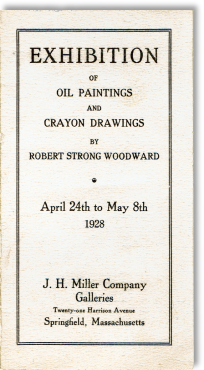 In the case of the 1928 JH Miller company galleries exhibition program there are a couple notable errors. For one thing, Winter: Scene from the studio window is again simply listed as "Winter." This could have been for the sake of layout symmetry or simply an error on the part of either the gallery or the printer themselves. There is also artwork missing from the list as well as one that never appeared at the exhibition. So now I have given you two examples of the painting Winter: Scene from the studio window being simply named "Winter" and so you may be asking yourself why we refer to this painting by a different name and for that answer we go to the newspapers. It is fairly common knowledge that newspapers are often notoriously incorrect. However, when it came to deciding what we would list Winter: Scene From the Studio Window, the newspaper was the main factor. 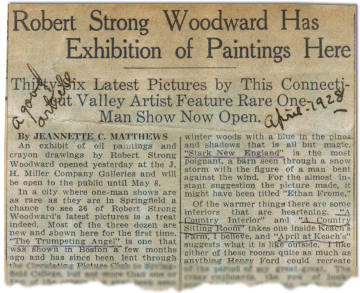 You see, we asked ourselves, ' how did the newspaper know the painting was from Woodward's Hiram Woodward studio window? Add to that, he named every version of that scene afterwards in a similar manner, then it stands to reason that it was the newspaper clipping at the top of the page (left) which is correct. 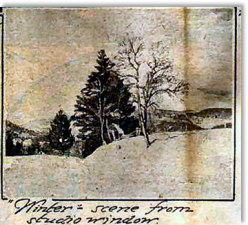 In another newspaper, reviewer and critic, Jeanette Matthews, at the time a very reputable art reporter named Winter: Scene from the studio window simply as "Winter" also. Did she drop the subtitle as editorial choice as a matter of saving space or did she simply go with the name provided in the program? We do not know, however, the other painting Woodward gave a subtitle, The Window: A Still Life and Winter Scene, had only one reviewer, of several, use the full name of the piece in their articles. One newspaper completely erred by mistaking it for a similar but entirely different painting, My Winter Shelf, which caused years of confusion for us and is another story entirely. For a second time in 5 years, these two winter scenes cross paths again. The first was Woodward's "One-Man Show" at the 1928 J.H. 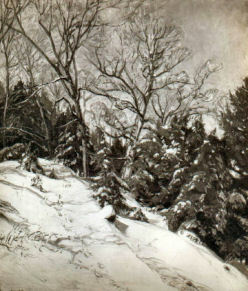 Miller Co. Galleries Exhibition in Springfield, MA, as Winter: Scene From the Studio Window, and Winter Slope, along with 4 other winter scene paintings discussed above. Then in 1931 both versions of the previous winter scenes hung together on the walls of the Myles Standish Hotel dining room by their given names Winter: From the Studio Window, a 25 x 30 oil and Winter, a 36 x 42 oil. Now here we caught a big break and demonstrates why we must use all of the available material we have at our disposal. Woodward was pretty good at keeping a collection of his exhibition programs and invitation cards. 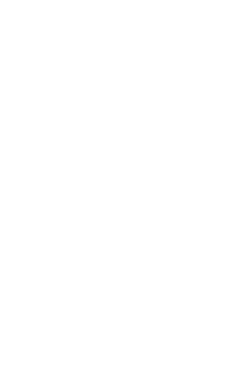 There are also odd photographs (not sepias) of several pieces of work with hand written notes on the back. We have one of each for these particular pieces. On the left is an announcement card for an exhibition at the Myles Standish Galleries with Winter: From the Studio Window, as the featured photograph a month before it hung in the hotel dining room. On the right is a photograph of Winter, we found in RSW's records with name and size written on the back. Without these two critical pieces of material plus our record of exhibitions, we would have no idea if these were the same version exhibited earlier or even if they were similar to earlier versions. Finally, as mentioned earlier, Woodward DID use the name Winter Afternoon, (seen to the right) one last time in 1940. He painted the house in which his grandparents once lived and where he stayed as a young boy every summer growing up. Keeping all of the 'multiple version' straight and organzied for both ourselves and you the viewer is no easy task. There was a time we simply would list it with the name we know and a number (1,2,3...) following it, however, as more paintings are discovered and more information processed and with that increasing discrepencies, editorial decisions must be made. In every case possible, we try to give a painting a unique name in order to keep it from going into the 'catch-all' Unnamed Gallery. The Unnamed Gallery is worth a look. There could be a number of reasons why a painting went unnamed. Often, Woodward didn't name pieces unless for exhibitioning records and purposes... He could have painted it, not named it, and sold it straight from his studio.